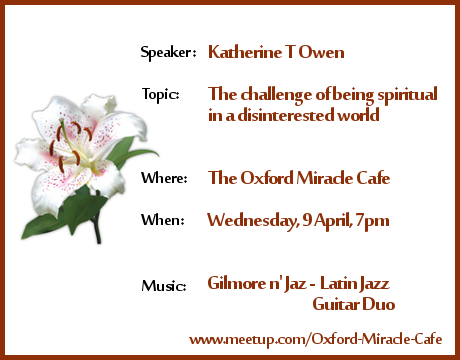 "The challenge of being spiritual in a disinterested world"
Katherine T Owen was the inspirational speaker at the Oxford Miracle Cafe. The subject of the talk was "The challenge of being spiritual in a disinterested world". The evening included a guided meditation led by Katherine. "Katherine was all you would want in a spiritual speaker. Authentic, funny, gentle and loving. Her talk was a delight and really helped remind me that it is OK to believe." "Wonderful poetry and an infectious laugh. Thank you for sharing your journey and observations of life, from the heart"
"Thank you so much Katherine T Owen, it was such an honour and a pleasure for me to listen to your talk and meditation and to thank you and talk to you at the end, what an inspiring, gentle, deep authentic talk and meditation! thank you :-) :-)"
"Love meeting Love was one of the most inspiring reminders I have ever been given. I am very grateful to Katherine, for this, and much much more." "Very inspiring and thought-provoking. Amazing poems." Katherine T Owen appeared as the guest poet at the Swindon Festival of Poetry, SouthWest England. The event, entitled "Spiritual Poetry", took place at the Richard Jefferies Museum. The audience participated in the second half by reading out their own spiritual poems. Speaker for Interfaith Swindon, UK. Is it OK to Believe? "It was a lovely presentation. I enjoyed your calmness and collective method of assurance that others could share in believing in their spiritual journey. I look forward to our next encounter." "I relate to your sense of isolation with not having a diagnosis." "I loved what you said about surrender." Katherine T Owen was an inspirational speaker at the Festival of Life, speaking on God love, Self love in a time of pain. The Festival of Life is held in Conway Hall, Red Lion Square, Holborn, London, UK. It can be hard to love ourselves at the best of times. When we get ill or things are going badly, we can find it even harder. Katherine talks about how she learned to love herself and allow God to love her through a time of pain - in her case a time of chronic illness. She takes you through some key steps so you can do the same. 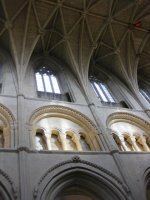 How Can We Understand The Faith Perspective With The Rational Mind? 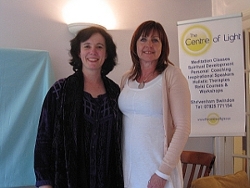 12 July 2011 Katherine T Owen was the inspirational speaker at the UK Centre of Personal Development (UKCPD) in Swindon. Talk 1hour 45 mins, including questions. When we practise NLP and take ourselves into an experience of something we hope for, are we practising faith? Where do NLP and faith meet? What are the fundamental differences? Is faith rational? What does modern science have to contribute to the discussion? Through a narrative, poetic text, and selected quotes, Katherine T Owen’s book It's OK to Believe takes the reader on a journey to reconcile the questioning mind with spiritual beliefs. She talks about her own spiritual journey and reads from the book as a starting point to discussing these questions. She proposes that the belief that we are a body living in a solid world is just that – a belief. The talk will be useful for those who work with people of faith and would like to better understand a spiritual outlook so as to build rapport and be of assistance. It will be equally useful for those who want to reconcile their questioning mind with their own spiritual beliefs. Such a reconciliation helps us to live life in a way that is congruent with both, ensures that our spirituality is robust in times of difficulty, and makes it easier to explain our faith to others. Some NLP language will be used. A handout will be provided for those who have not studied NLP. Katherine T Owen was bedbound for 14 years with severe Myalgic Encephalomyelitis (severe ME). For all those years she needed to be fed, lived with a commode next to the bed and drank through a straw. Speech and movement were minimal. She set out to build her faith for healing. She experienced a dramatic recovery on 1 May 2008 whilst doing the Lightning Process (an NLP based technique). She has continued to build up her fitness since that time. 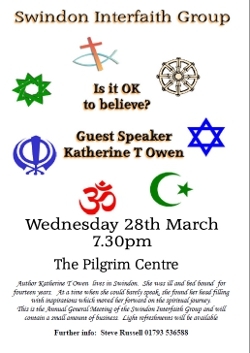 Katherine T Owen is a Christian mystic, a student of ACIM and is trained to NLP practitioner level. Click through to BUY Katherine's book, It's OK to Believe. Inspirational speaker, Katherine T Owen was the key speaker at the Global Love Day 2011 celebration in Swansea, Wales. She read narrative and poems from It's OK to Believe and talked about her spiritual journey through difficult times. Later in the day, she spoke on the subject of unconditional Love and led a guided meditation to receive love and send it out to the world. The Centre of Light, Shrivenham, Near Swindon, Wiltshire. Inspirational speaker, Katherine T Owen. How can we give ourselves permission to hold our spiritual beliefs when others oppose them? How can we move forward gently and with love through a world which isn't comfortable with our beliefs? 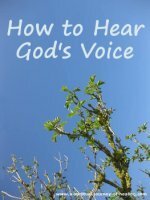 This book relates Katherine's journey to make peace with her own spiritual beliefs and to be comfortable with being a person of faith in a world that sometimes regards such beliefs as irrelevant or irrational. The audience will be led in a guided meditation to forgive those who seem to make it harder for us to commit to spiritual practice. This may be someone we know or an authority figure from a former belief system we have now moved on from. It may simply be someone we love who we would like to share our beliefs. Through visualisation, we can transform these relationships to ones that allow us to be at peace with any opposition, or even to be strengthened by it. The spiritual journey is one of an increasing sense of unity with all whatever our differences. Katherine is a Christian mystic and a student of ACIM. November 2010. 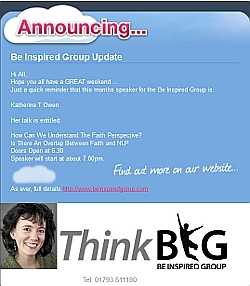 Inspirational Speaker, Katherine T Owen gives a one hour talk, followed by question time. The talk included reading from and discussing the inspirations in her book IT'S OK TO BELIEVE, A Journey with Faith and Reason . It included the subject of quantum physics and spirituality - ways in which science and spirituality agree.